Sometimes it’s hard to believe that it is twenty-one years since Ayrton Senna’s third and final title. Following in the footsteps of rival Nelson Piquet and mentor Emerson Fittipaldi, Senna commanded an incredibly successful period for Brazil in Formula One that saw eight titles go the way of Brazilian drivers over the next two decades. Since Senna’s untimely death at Imola in May 1994, the country has not had a world champion. Drivers have come and gone – most notably Rubens Barrichello, while others linger on (Felipe Massa) and some disappear in a cloud of controversy (see Nelson Piquet Jr.). GP2 rookie and 2011 British Formula 3 Champion Felipe Nasr is hoping to turn the tide and the 20-year-old from Brasilia may find himself in a prime position to do so in the coming years. Nasr even took a podium at the Daytona 24 Hour Race at the beginning of the year, showcasing a maturity and versatility that goes beyond his years. Always patient, ready to learn and methodical in his approach, Nasr looks like a driver ready setting himself up for a GP2 Series title challenge next year, but first there is 2012 to complete. The Motorsport Archive: Congratulations on your 2nd place in [Sunday’s] Sprint Race. Starting pole, it was not the result you may have wanted. Felipe Nasr: Basically, because we had problems on the clutch yesterday, we had to put on a new clutch for today, which is quite hard to get the right feeling just before the race. You’ve never tested the clutch before, so that was the case of having a bad start, but it was done. It was critical and lost a few places there and quickly understood that the leaders had a better pace in the initial part of the race, so I just started looking after my tyres, which paid off. TMA: That was something that definitely came across from the outside. At what point did you think “time to move up the gear”? FN: In the last eight laps, I started picking up the pace and now it was time to push again and it was definitely worth doing, because we are comparing to different cars, different teams with different set-ups – they were more aggressive in the initial [laps] and middle of the race, so in the end I just saw the two guys struggling on tyres and that was quite good for my car because it was about keeping the car quite smooth and taking care of the tyres and I was shortening the gap. TMA: You had a battle with Calado late on – a battle that you won, but it must be frustrating to have dropped too far behind [race winner Josef] Kral. FN: I saw Calado really struggling, we had a few battles there in the last laps, so it was a good move then. As I had done yesterday, I waited for the last corner and it was a matter of having better traction and positioning the car right, but it was tough work, because Calado is a good fighter. He doesn’t let things go easily. In the end, it was good to score points in both races. Of course I think the win must be very close right now, there are a few details that we need to work on, but it’s good to be back on the podium. I’m happy. TMA: That must have given you some satisfaction, because that last lap and a bit, even though Calado’s tyres were gone, you could see he was still fighting very, very much. FN: That’s Calado. He’s one of the harder guys to overtake; he doesn’t let it go easy, but if it’s fair then it’s fine. It was a good battle; inside the car it was good. That’s racing; it’s a good feeling. TMA: With regards to being able to save the tyres, something I’ve got the impression of in the last few years (in Formula 3 and BMW) that you seem to have a very methodical approach. How have you been able to utilise this with DAMS? FN: It was a good learning this year. I’ve learned a lot – it’s a huge step coming from Formula 3. I had to learn how to drive this car, get used to the carbon brakes, the tyres, manage the degradation, so it’s a lot of things at once that you have to learn, so I could definitely see throughout the year the progression is clear. It’s a shame that we didn’t get a win yet, because we had a few opportunities to get them, but also we had problems in the car which let me down a few times, but in the end it’s motor raving. You take profit of the experience you learn, but I’m the kind of guy that really studies the race I’m doing. If I have to attack I will, if I have the car for the last five laps and I need to save the tyres and look after who is around and manage the situation well, so I think it’s a good combination with the team. I really feel they have a car that that looks after the tyres, so maybe it’s not as aggressive as the others who have a strong first ten laps and start to drop off, but in our case we have a strong car for the end. TMA: When you look back, would it be much of a drawback if you didn’t get that win or can you take positives from the points and podiums you’ve scored? FN: Still with two rounds to go I will do my best – I want to push the team to really take this win, but if it doesn’t happen then I know that we did our best and I would be happy to go home like this. A win is really deserved; not only for me, but for the team – we’ve been working hard; we know a few times they have been quite surprised by a few mechanical problems in the car which really destroyed a few races. Sometimes we could’ve started on pole, or been on the podium many times and fighting for the win, but in the end we tried our best, so we will see at the end. We have Monza, which is a track I know from BMW and Formula 3 and Singapore, which I’m only one of the few that know the circuit, because I raced with BMW Asia there, so I’m really looking forward and I will push until the end. Felipe Nasr may well finally take that win before the year is out, but one thing is certain, the Brazilian has made an impressive mark this year. 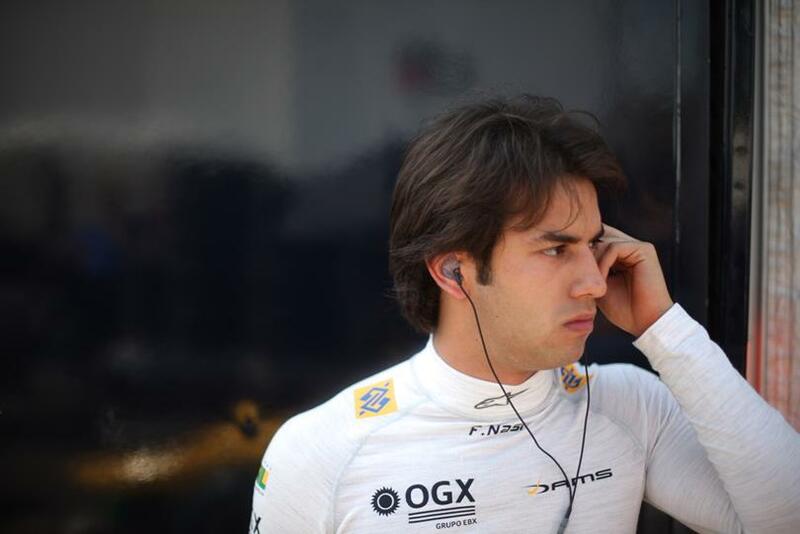 Nasr starts today’s GP2 Feature Race from 10th on the grid. Whether that becomes a title charge in 2013 depends on him.